It's no secret that football has received its fair share of negative publicity. There has been a heavy push to inform current and prospective players about the dangers of the sport, notably head trauma. But despite the obvious injury risks, I believe football remains one of the most rewarding sports a child can play. Ask any former player who has been fortunate enough to avoid serious injuries—and even some who have suffered their fair share—and you'll often hear praise about their time on the gridiron. After playing football at both the high school and collegiate levels, here are eight things I gained from the sport. Participating in football—like any sport—provides many health benefits for children. It's a physically demanding game that provides an opportunity for players to improve their speed, agility, strength, hand-eye coordination and overall cardiovascular endurance. The friendship built amongst a team of football players is unlike any other sport due to the high volume of teammates. With dozens of players working toward one common goal, the bond many kids develop with each other is priceless. This camaraderie is a lifelong benefit for children, as they will quickly appreciate the importance of developing close relationships with others. Football is a game of inches, and this margin of error requires a keen attention to detail from everyone on the field. One wrong step, one dropped pass or one mental error can negatively affect any given play. Kids who play football will learn the importance of being disciplined with everything they do. Some days, putting on more than 10 pounds of pads and a helmet and lacing up the cleats just does not seem like a fun thing to do, especially in the heat. But practice makes perfect, and preparation is needed to be successful in football. The strong work ethic football players develop is a vital asset they can carry with them for the rest of their lives. Football is truly a team game. With 11 players on each side of the ball, everyone is counted on to play their individual role. There's a tremendous amount of accountability required from each player to do a specific job on every play. This teamwork helps children become accustomed to working with others, a skill that is required in almost every profession. Along with rugby and hockey, football is one of the most physical sports. The risk of injury is greater than most other sports, and bumps and bruises are nearly inevitable. These bumps and bruises heal over time, however, and players learn how to fight through pain and give their best effort despite what limitations may be present. In addition to physical toughness, it takes a strong mind to play the game of football. 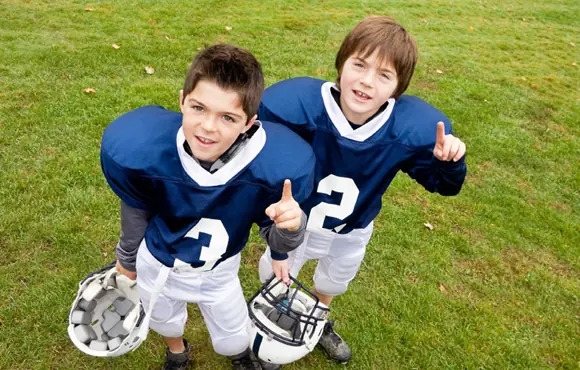 Whether it's battling through a minor injury or overcoming adversity after a turnover or a mistake, children often develop mental toughness they may never have discovered otherwise. Some kids have already identified their favorite sport, and may want to pursue it at a higher level in the future. For these children, playing football can become a great cross-training activity in the offseason. Several skills developed on the football field, such as hand-eye coordination, agility and vision, can translate to other sports.